DJ Ability: So, how are you doing? Ina: I’m doing great this morning. DJ Ability: Oh, that’s wonderful! DJ Ability: So, you know we had a few questions…You know we found about you through Twitter. We saw your rendition of “Home Sweet Home.” (by Motely Crue). We want to make sure to showcase you today. DJ Ability: What is it that drew you to singing? Why do you like to sing? Ina: Because it makes me feel good about myself. I like to be a voice ... Más informaciones for those autism kids that don’t have a voice…and with people with mental health…Some people just don’t like to get out there and say things. So I sing for them. Because I think everyone deserves a voice. DJ Ability: Oh, oh…that’s great. So, you’re an advocate too, very talented…So when did you actually start singing? DJ Ability: 6, wow! Wow! Ina: Like 6 years old. Ina: Well my mom and dad knew I had a gift when I was little. So that put me in ? school of music. And I got a voice coach named Taylor. And he’s one of the best. I still go to see him every other week. We work in the studio. So I’m still working with him…ever since I was 14 or 15. DJ Ability: Well, you do have a beautiful voice. DJ Ability: So, do you write your own poetry or lyrics for your songs? Ina: Thank you. Well, I wrote one song. It is on iTunes. It’s under Tiff Ina. And the song is called, Show Me the Way.” It’s not a remastered version. I’m working on doing a country CD. We don’t have a date set yet though for that. It’s working. It’s a work in progress. Ina: I love Patsy Cline. I love like the older country music. I’m a country girl…I mean I like Alan Jackson, stuff like that. Well I’m going to play “Home Sweet Home” since I finally got it up. Ina: Let me know if you can hear it. Ina: There you have it! DJ Ability: Oh, thank you! You know what?! You give me goosebumps! That’s wonderful! You know your part of our podcast for #LoveAbility. I don’t know if you saw the poster. As our guest DJ for the day, we’d like to have you introduce a song We thought it would be Apropos to play Stevie Wonder. I know that you’re familiar with Stevie Wonder. Hello, this Ina, guest DJ. 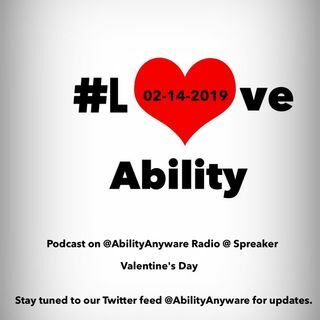 Welcome to #LoveAbility Podcast on Ability Anyware Radio. DJ Ability: And thank you Ina from the “bottom of hearts” for being a part of this podcast today. You did a terrific job! Ina: Thank you for having me. DJ Ability: We look forward to hearing about the release of your songs when we can download them. We’re very excited. And take care! Ina: Thank you. You too. DJ Ability: Ok, bye, bye.